Published: April 27, 2018 at 05:36 p.m. Updated: May 3, 2018 at 10:15 a.m.
After a 15-season career with the Dallas Cowboys, 11-time Pro Bowler and franchise leading tight-end Jason Witten has retired from the NFL. Take a look at these mind-boggling stats from Jason Witten's career. 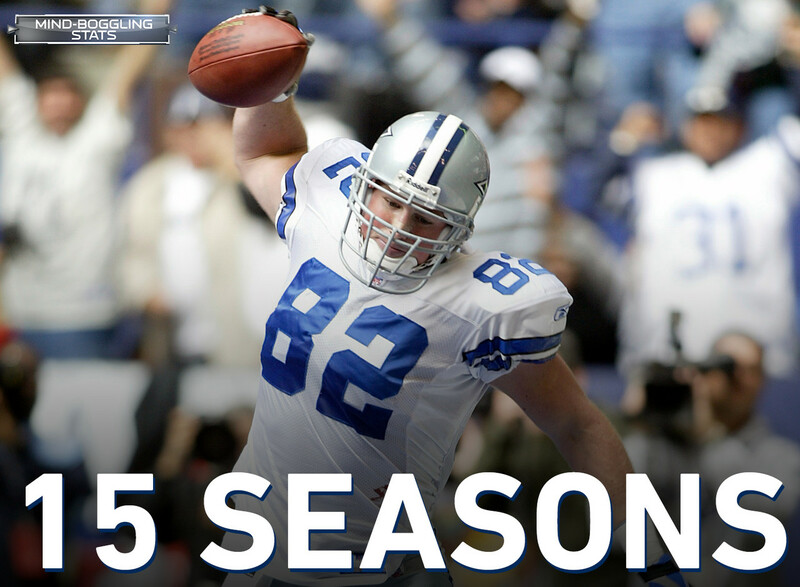 Jason Witten was drafted in 2003 by the Dallas Cowboys and has played 15 NFL seasons all with the Cowboys. Jason Witten's 11 Pro Bowls are the second-most of any tight end in NFL History. Jason Witten was the 2012 Walter Payton Man of the Year. With 1,152 receptions, Witten is the Cowboys' all-time leader in receptions and has the fourth-most receptions in NFL history. This offseason, the Cowboys have lost two of the three players with the most receptions in their franchise history. Jason Witten had the most receptions while Dez Bryant had the third-most. The duo swap places for receiving touchdowns, with Bryant having the most and Witten having the third-most. Witten's 12,448 receiving yards are the most of any tight end in Cowboys' history and the second-most of any tight end in NFL History. After the retirements of Jason Witten and James Hanna, the Cowboys' current tight ends, Rico Gathers, Blake Jarwin, and Geoff Swaim, have nine combined career receptions. Since 2017, the Cowboys have lost three cornerstones of their franchise: quarterback Tony Romo (all-time leader in pass yards [34,183] and pass touchdowns ); tight end Jason Witten (Cowboys' all-time leader in receptions [1,152] and receiving yards [12,448]); and wide receiver Dez Bryant (Cowboys' all-time leader in receiving touchdowns ).